A friend of mine (hi Torii!) told me about a dream she had where a man was growing human heads in flower pots. It sounded like a good time, so I ran away with it a bit. I love it when my friends tell me their nightmares. People don’t usually like to listen to mine. Except you lovely people. This changes so often. My heart is a revolving door of affection for horror stories. But the folks who keep to the middle of the door and just keep going round past dizziness are Caitlin Kiernan, Shirley Jackson, Stephen Graham Jones, Jeff Vandermeer, and Paul Tremblay. What a dreadfully painful question. My spinning door heart is already at war with my answer. And have you ever tried to slam a revolving door? I’ll be up all night changing my answer. I’m a sucker for haunted old houses. I NEVER get tired of ghosts and creaky stairs and hidden passages. My first novel will be released from Journalstone/Trepidatio in early 2019. It’s a YA/adult crossover horror story set in an English boarding school in 1926. The title is currently in flux, or I’d tell you what it’s called. So for now, just keep your eyes peeled for Sarah’s Book of Unpleasant Happenings. An anthology I’m editing for Pantheon Magazine, called Gorgon: Tales of Emergence, will be released this fall. We have an incredible lineup of authors and I’m so excited to share their stories of transformations with the world. I’m currently tidying up my second novel manuscript and writing my third. I’m having WAY too much fun. 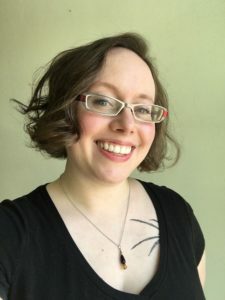 Sarah Read’s work can be read in The Best Horror of the Year vol 10, Black Static, Gamut, Lamplight, and Behold! : Oddities, Curiosities, and Undefinable Wonders, among other places. Her debut novel will be released in early 2019 from Trepidatio, an imprint of Journalstone. She is the editor of Pantheon Magazine and its affiliated anthologies. You can follow her at her website www.inkwellmonster.wordpress.com, or on Twitter or Instagram at @inkwellmonster. 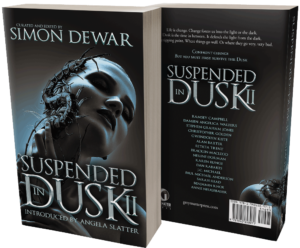 This entry was posted in News and tagged Caitlin Kiernan, Grey Matter Press, Horro, jeff vandermeer, Paul Tremblay, Sarah Read, shirley jackson, Simon Dewar, Stephen Graham Jones, Suspended in Dusk II. Bookmark the permalink.